We're only one month away from our big weekend! Last week our reunion committee met to put together the faculty invitations and run down the reports on the final details, including the first reservations received. Before, it was an idea...but now it's a reality! People are putting their money where their mouth is and we've got to make it happen. Yikes! Despite all the work involved with planning a reunion, I really am loving the chance to cook for my friends! Last week's working dinner menu was another blast from the past - Hamwiches. I've been making these since the early 70's, mostly for groups and parties. I usually make them on those cute little Pepperidge Farms Party Rolls that are oh-so-perfect for heavy hors d'oeuvres or pick-up buffets. But Hamwiches also work well when made on larger sandwich buns to make a meal with soups or salads. It's one of those things that makes My Favorite Husband say, "Oh good! We haven't had those in ages!" The Hamwiches make up in no time and can even be made well in advance and kept in the freezer for a quick dinner or snack - for one or a crowd! If you've never had these tasty morsels - like you weren't around in the 70's and missed them in their heyday - file them under Tailgate, Make Ahead, Quick & Easy, Party, Guy Food and any other time you need something tasty without much fuss. A bag of foil-wrapped sandwiches in the freezer means easy dinner in a hurry - for any night during a busy week. Melt butter and sauté chopped onions. Stir in mustard and poppy seeds to blend. Allow mixture to cool slightly. 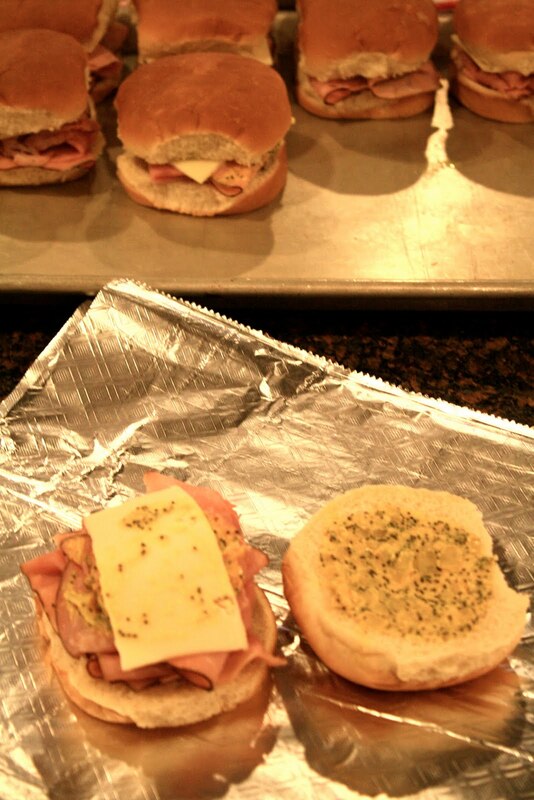 Place ham on bottom piece of bun, cover with cheese slice. Spread top half of bun with 1 spoonful of onion-mustard mixture. Place sandwich halves together and wrap in foil. To serve: Preheat oven to 300 degrees. Place foil-wrapped sandwiches in a single layer on large baking sheet and heat for 20-30 minutes. Sandwiches may be frozen before heating – allow extra 15 minutes to heat frozen sandwiches. Serve warm. Note: For hors d'oeuvre size or small appetites, make these on Pepperidge Farms Party Rolls. Slice the entire pan of rolls in half horizontally, fill bottom half of rolls in tray with sandwich ingredients, replace top of rolls and slice to divide into individual roll sandwiches. Leave individual sandwiches on tray and wrap tightly in foil. Store in ziploc bags in freezer until ready to bake and serve as directed above.